Cider pressing will take place on three Fridays, Oct. 12, 19, and 26, in the afternoon for the 2018 season. Our cider is made from our own handpicked apples. It contains no preservatives and is not pasteurized*. It is known for it’s delicious fresh clean taste. It has a great following; folks come from miles around to enjoy this seasonal drink. 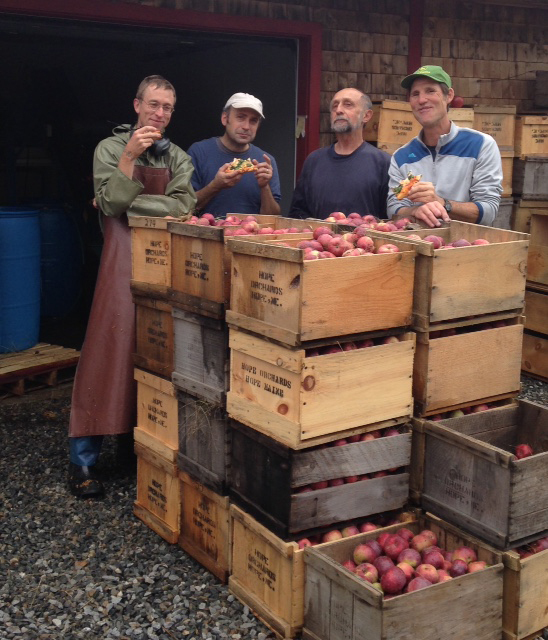 September cider is made primarily from Macintosh and Cortland apples. It is described as crisp and tart. Our later apples yield a sweeter juice, with interesting flavors contributed by Empire, Golden Delicious, Spy, and Macoun apples. Our cider is sold exclusively here at the orchard. We press every Friday, beginning in late September. Gallons, half gallons, and pints are sold at the stand on Fridays, Saturdays, and Sundays, while the supply lasts. If you would like to request five or more gallons for your freezer, contact us at apples@hopeorchards.com. *Unpasteurized cider can be a health hazard to infants and to the elderly.